Yesterday was spent in Eugene helping my brother. Overall, it was a very good visit. Much laughter happened. I suspect he thinks I’m totally nuts for caring so much, but that’s how it goes. I can live with it. The month of February sketching is almost over. I didn’t manage to draw everyday, but that’s ok. It won’t be the end to this exercise. The above quickie is Mr Reggie looking rather scruff. Add in the shaved spot from his minor surgery and you get a goofy dog. Fortunately it fits his personality to a “T”! During his dental treatment, the vet techs gave him a cute bandanna to wear home. He’s still sporting it. The two doodles depart our home on March 10th. Hard to believe 19 months of pet sitting will close. I desperately tried not to become attached, but the bond formed. It will be difficult to have them leave, but the cats are already rejoicing! There is even a going away party in the works for Saturday March 7th. I think I’ll actually get the carpets cleaned before the event! It’s so hard to stay loose! There is a life drawing class starting soon in my area and I anticipate joining in for just that reason. 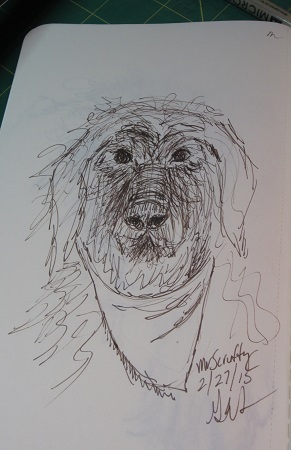 There is so much character in your dog sketches! I love a goofy dog. Mr Reggie is quite a handsome fellow. The energy of you line works perfectly! Thank you for including the tools you used, always so insightful. It’s always nice to have a household of “furry muses” to choose from. You certainly have your share! One week remaining with our foster boys (the doodles). Then life will really slow down.